I misjudged the timing to enter Copper Mill Lock thinking Jan had filled it and was about to open the top gates. I’d untied the centreline and reboarded the Waiouru only to realise the lock wasn’t ready. There is a weir to the east of the lock approach and the current was pulling Waiouru towards It. I managed to recover by positioning Waiouru downstream of the weir against the lock approach wall. Looking back I realised there was a hire base above the lock on the off side. 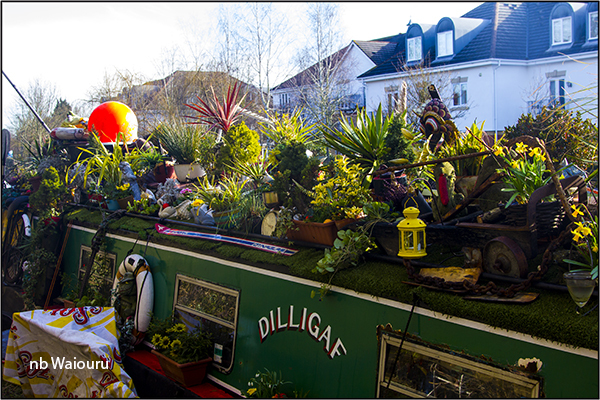 I think the name is Hillingdon Narrowboat Association and there were some additional words about community boating. The water from the weir re-joins the canal below the lock at a reasonably strong flow. Waiouru was pushed sideways as we powered through. This was followed by a second flow from the same side. The local canoeists appear to have taken the opportunity to use the location. This area contained a number of corn and paper mills. However in 1781 the corn and paper mills were sold and converted to copper mills. The copper mills ceased working in the 1860’s and reverted to paper mills. However in 1890 the paper mills were again converted. This time to asbestos mills. These operated until the 1920’s. I’ve been telling Jan to be careful about tipping the dishwater into the canal. It contains food scraps which might encourage an excessive growth of the local flora and fauna. Looks like I was right. Two other items of interest today. 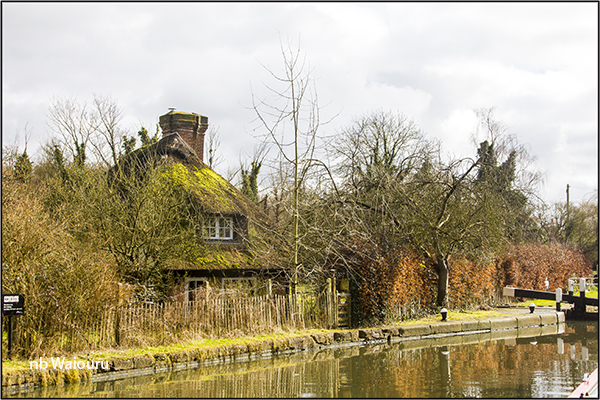 The first was a thatched cottage above Black Jack’s lock. I assume this thatch will shortly require replacing? 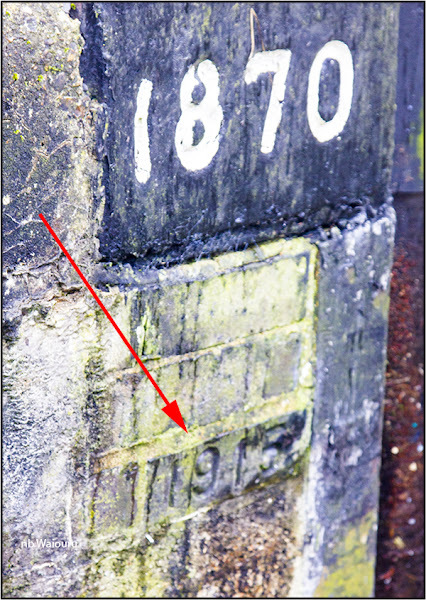 Jan was in the process of closing the top gates on the lock when I noticed the painted date adjacent to the gate hinge. What I found particularly interesting was a second date cut into the brickwork below. This date was 1915. 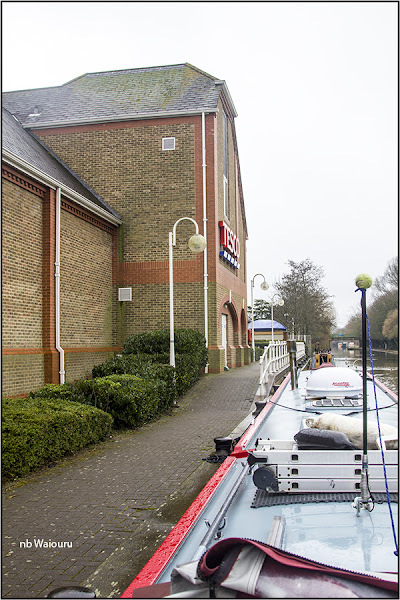 After reversing back to the water point below Batchworth Lock and filling the tank (good water pressure) we moved forward to the Tesco moorings for further restocking. 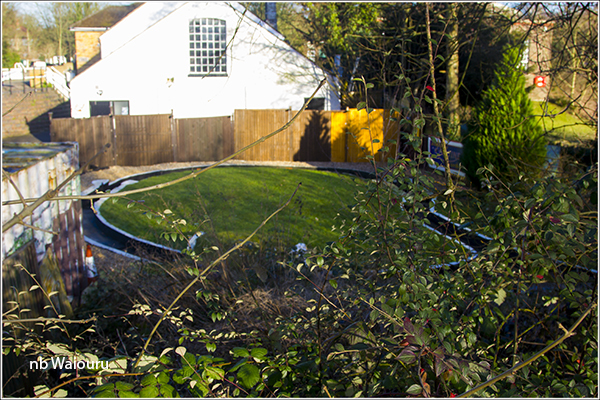 But not before noticing beside the water point is what’s claimed to be the only model canal in England. The canal is dry and the lock gates are missing. Must be a winter stoppage! These canal side supermarket moorings are very good. 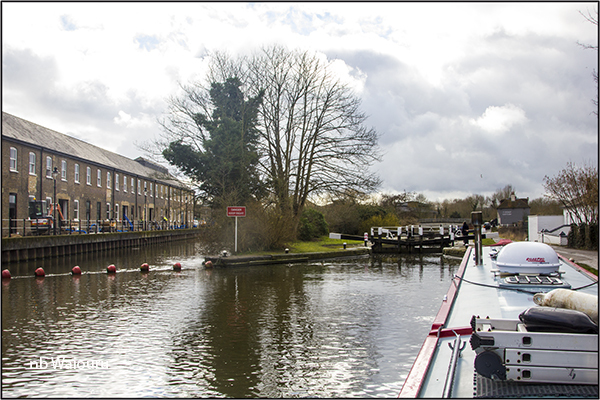 Two hundred years ago Rickmansworth was a busy canal location with a number of feeder arms to local industries. Salters Brewery used boats to transport their beer down through Chess Lock and onto the canal for transport to Uxbridge. There were also two nearby paper mills. 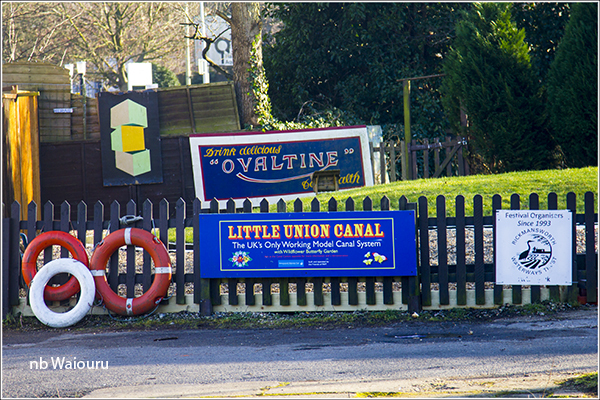 In 1905 WH Walker & Brothers started a canal business at Frogmore Wharf building and repairing wooden working boats. WH walker finally closed in 1988 and Tesco subsequently built the supermarket on the site. 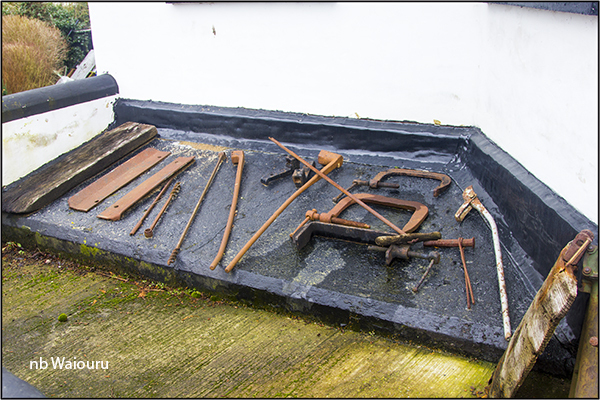 There are a number of canal metal components in the front yard of the lock keepers cottage at Stockers Lock. The cottage is the home of one of the local CRT employees. We were informed by one of his colleagues he had been employed by BW/CRT for 46 years. I’ll admit to only recognising a minor portion of these components/tools. 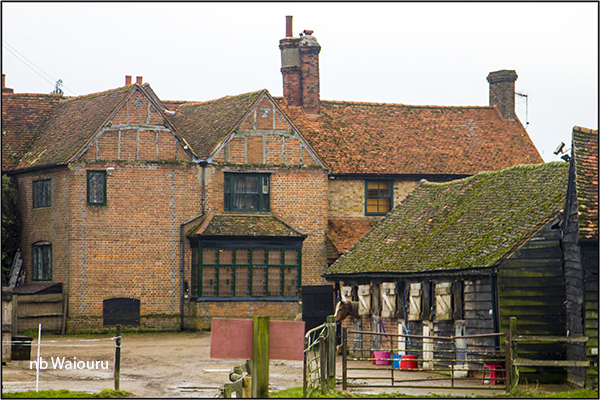 There is a rustic looking set of farm buildings opposite the lock cottage. Peering down the farm lane it appeared to be horse stables. There was a sandwich board outside the door to the church of St Mary the Virgin, Rickmansworth inviting you to enter. Seizing the opportunity I spent 30 minutes wandering around the interior. 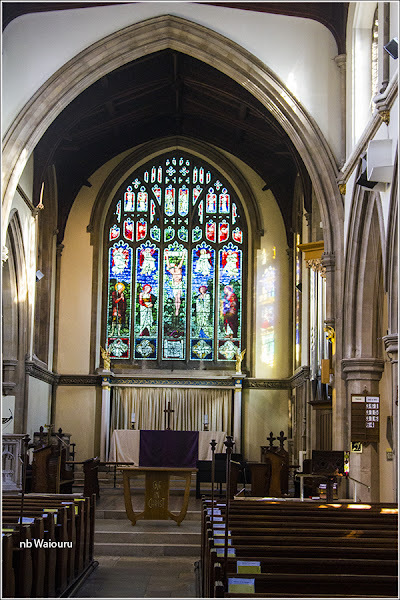 There was a plaque on one wall that mentioned the church had electric lighting installed in 1922 paid from the bequest of a local parishioner. There has been a church here since 1270AD. But not this church! I almost felt cheated upon reading this church was constructed on the site in 1888. It’s only 125 years old! 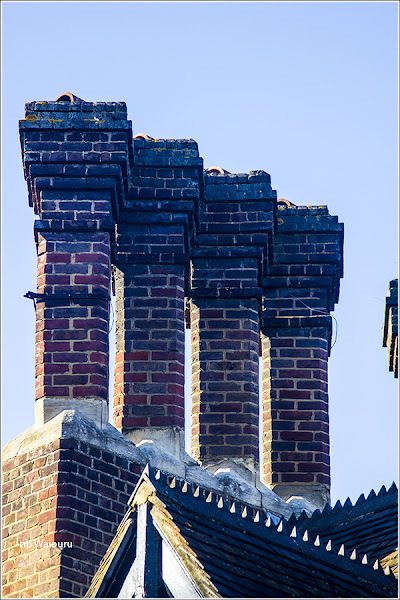 Moreover the tower and vestry were extensively refurbished in 1999. Some of the surrounding buildings look older. 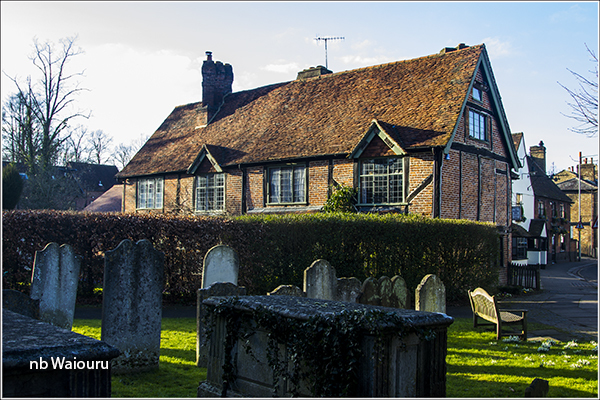 I think the above building might be the old vicarage and if so; parts of it date back to 1470AD. 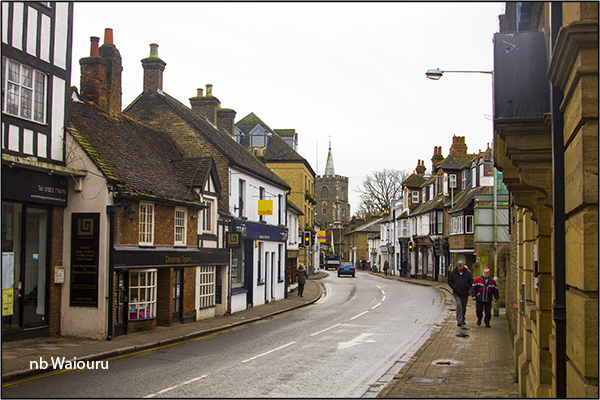 The old town centre and High Street remain but once beyond the immediate vicinity the remainder of the town looks bland and modern. One thing I remember from the three years I spent in England as a small boy was the difference in shop awnings compared to NZ. In NZ shops have a permanent flat veranda over the footpath which provides shelter from both sun and rain. In England all the shops had a retractable canvas awning which was frequently not deployed leaving passing shoppers to get wet. 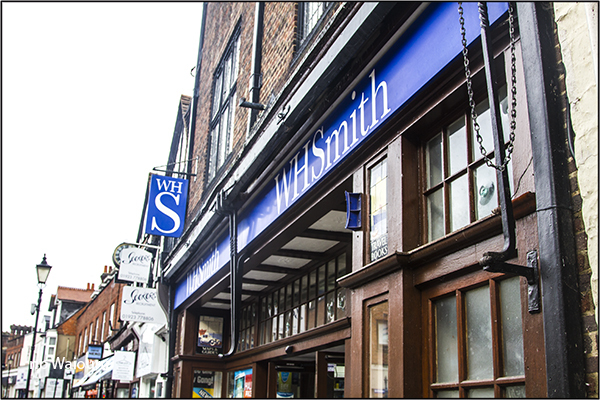 I happened to notice the WH Smith outlet in Rickmansworth appeared to have one of these retractable awnings. 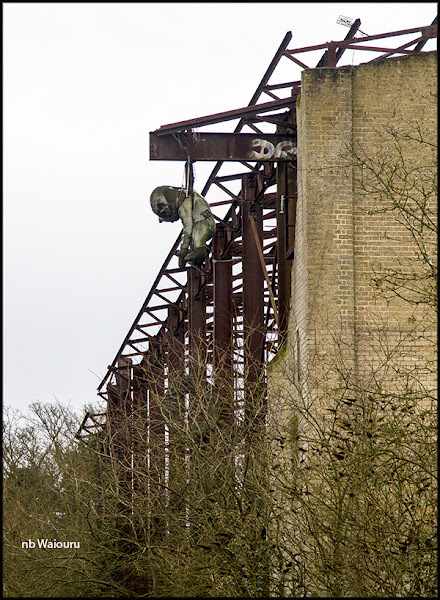 You can see the folding iron support arms in the photo below. 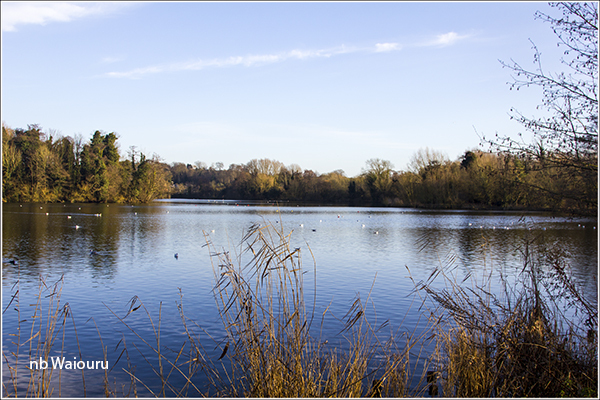 A large amount of gravel was extracted from the areas surrounding the town and these disused pits have been converted to parklands or anglers reserves. 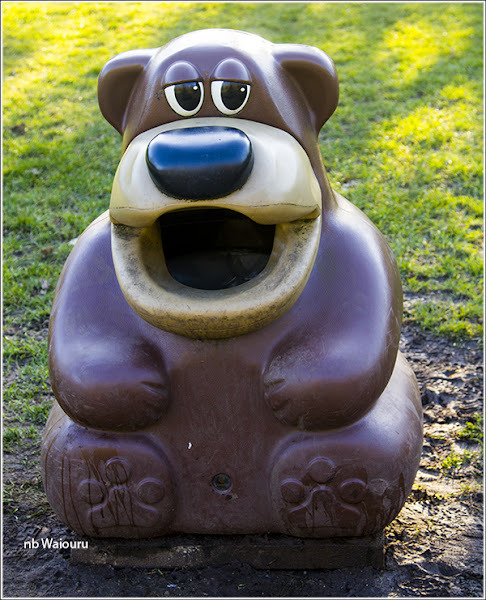 It was in one of these parks that I discovered another two local animals. 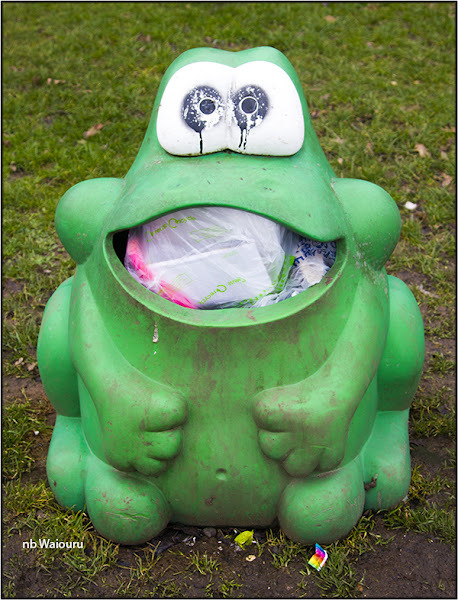 What a good idea to encourage children to keep the park tidy. The route back from Watford took me to a Morrison’s. Unfortunately they didn’t have the items I wanted and missed out on my business. 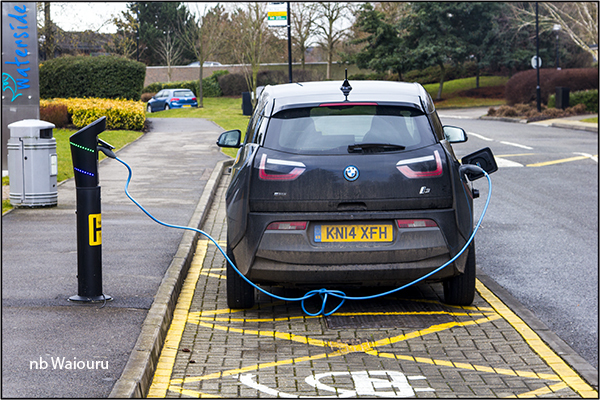 Walking through a new commercial park I passed this electric BMW on charge. I noticed some of these pods in Hemel Hempstead. Never seen them in Australia, but that may be due to the distances between locations. 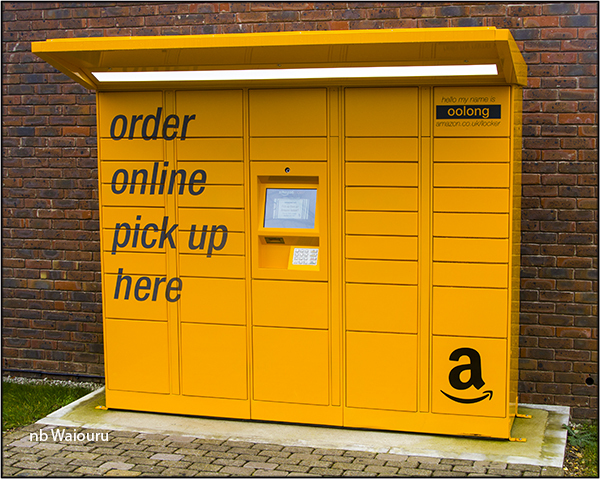 Another first for me was the Amazon collection centre. There was a footpath across ‘Common Moor’ which led to a former railway alignment and by following it I found myself back at the moorings on the River Chess where the CRT rubbish bins are located (yesterday’s post). Both Les (nb Valerie) and Paul (Waterway Routes) have already explored this area. There are eight boats on permanent moorings here. I also came upon the CRT water point. 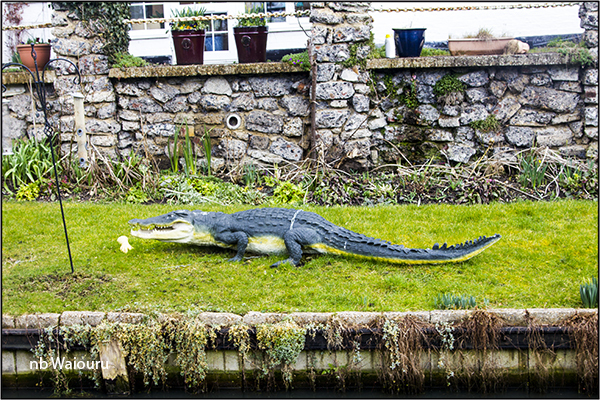 It’s in a rather strange location being positioned on the footpath with no obvious or easy access to the river. The boats are behind the fence on the left and down a bank. 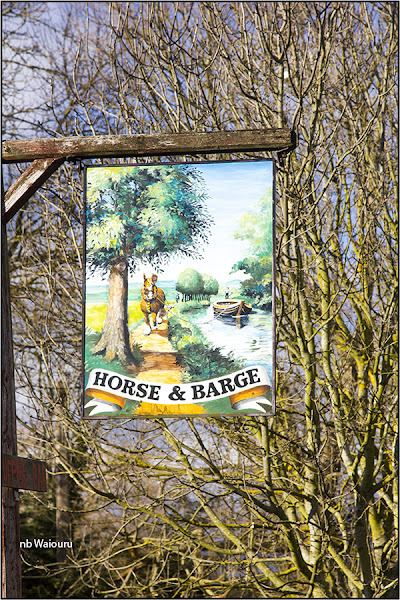 The water point is so far from the canal it must be exclusively used by the boaters moored on the river. 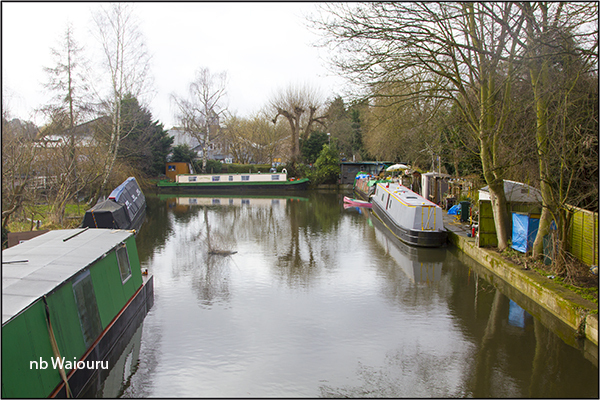 The CRT rubbish bins are behind the hedge which is behind the cream boat in the distance. 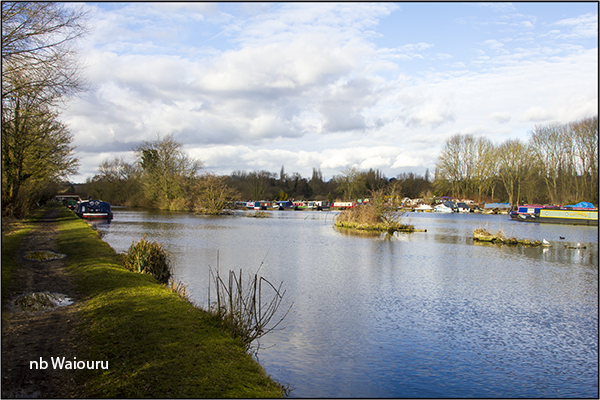 My afternoon walk took me west out of Rickmansworth as far as the M25 London Orbital. An interesting walk through more countryside and this time I was able to record two short lengths of footpath not currently on the OSM. 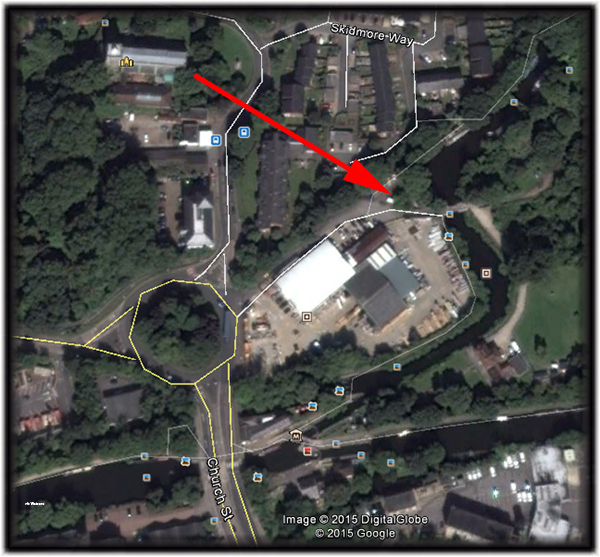 The right arrow points at the location of the new Morrison’s supermarket. It’s reasonably close to the canal. I can’t finish this post with mentioning a comment left on yesterday’s post by Marilyn (nb Waka Huia). It reminded me of the story about the young Alaskan backpacker who was in Europe doing his OE (overseas experience). He was staying in a cheap hostel in a small country town in Spain and had gone to see his first bullfight. That evening he went to a local restaurant and; not understanding or being able to read Spanish; he randomly pointed to a dish on the menu. His meal turned out to be vegies and two large meatballs covered in a tasty sauce. He was impressed and left a small tip. A week later he returned to the same small hostel after attending the ‘Running of the Bulls’ in Pamplona. Remembering the restaurant and the delicious meal he returned and ordered it again. Whilst the meal was just as good, the meatballs were much smaller. Thinking he might have left too small a tip on his previous visit he called over the waiter and complemented him on the meal but mentioned the size of the portion. The waiter was most apologetic and whilst wringing his hands commented “Ah senor….. the bull….. sometimes he wins! The Rickmansworth optician could do great business with the local dog owners and the dogs on the towpath certainly don’t suffer from constipation! 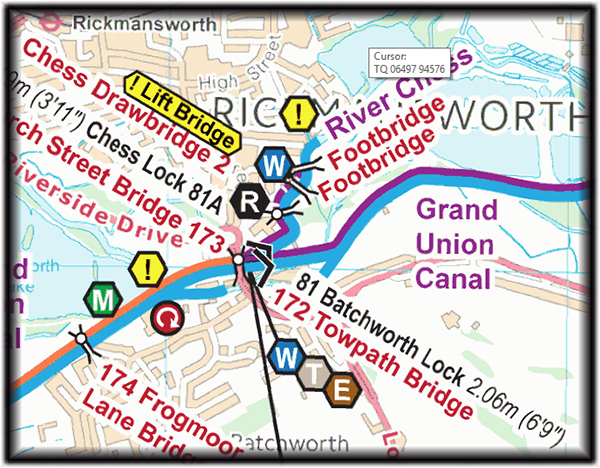 We would never have found the CRT refuse disposal bins in Rickmansworth if it wasn’t for Paul Balmer’s excellent canal maps. I will provide some instructions on how to find the location for any other boater coming this way who do not know where it can be found. 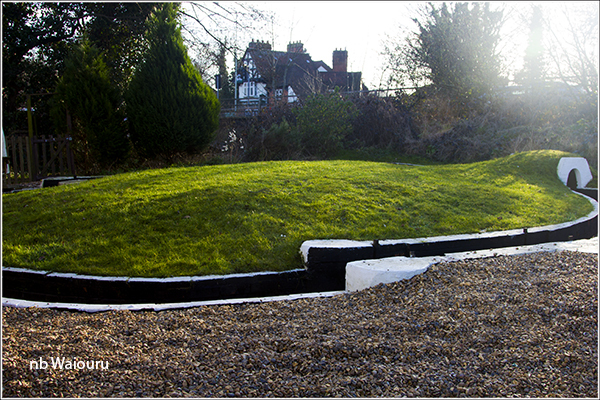 The logical place for the bins is on the main canal beside the water point below Bratchworth Lock. However they are not located there. 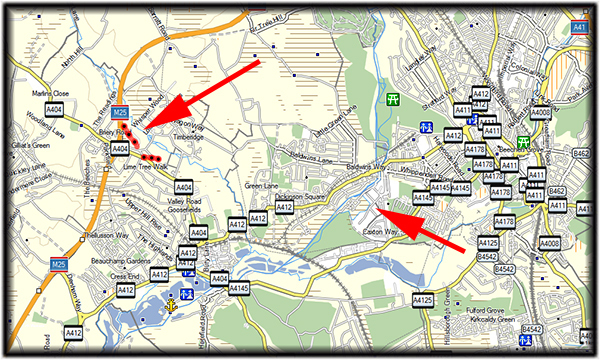 The Waterway Routes maps show the bins up the River Chess. 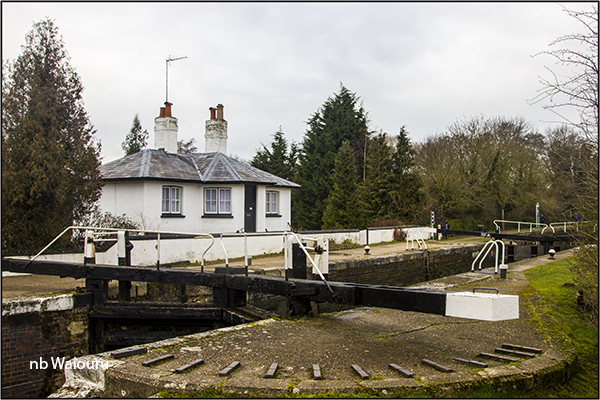 I walked up the towpath from Chess Lock with two bags of rubbish thinking “This is a disused arm!” On rounding the first bend I saw a windlass operated lift bridge. To my surprise, beyond the bridge was a row of moored boats. These are obviously private moorings. 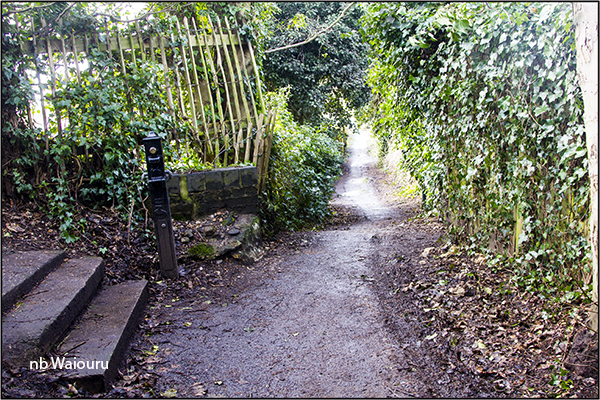 The refuse bins were behind a row of trees in a secluded spot. The following screen dump from Google Earth shows the exact location. Being Sunday we were due for our usual cooked lunch. There’s a pub on the other side of the canal specialising in traditional English pub food and Nepalese? 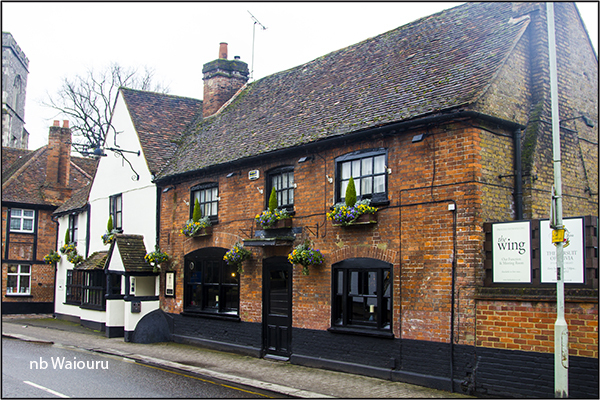 On the road into the town centre there’s an upmarket looking pub/restaurant. 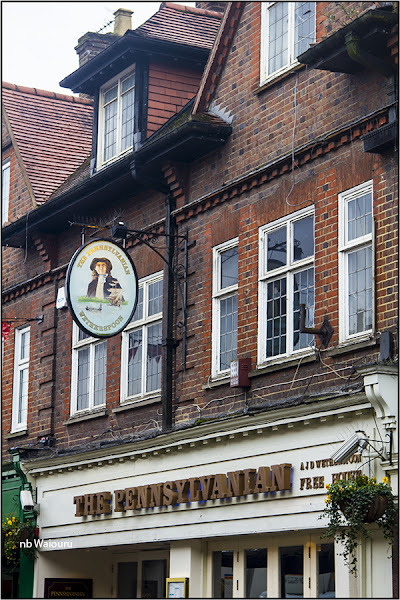 However we decided to walk to the High Street and eat at The Pennsylvanian. 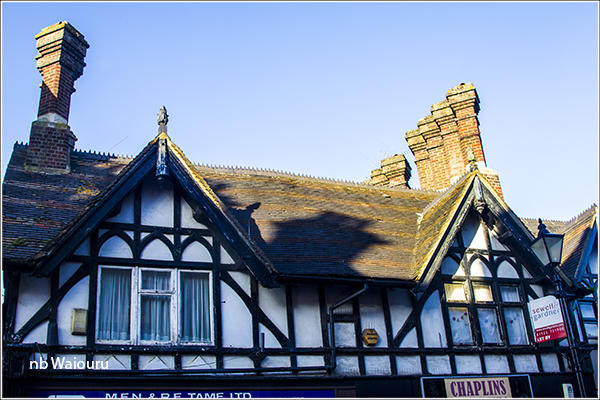 Yes, it’s a Weatherspoons pub. 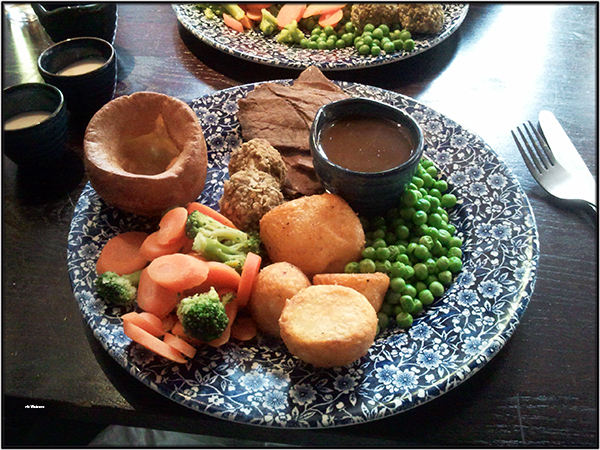 We opted for the medium sized Sunday roast beef and it turned out to be a good choice. Neither of us could have eaten the offered large portion. 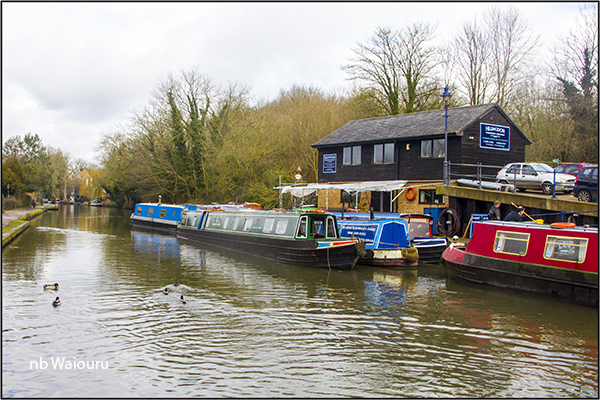 We are keeping an eye on the winter maintenance stoppages and will probably stay in Rickmansworth for a few more days. Certainly not a long as the boater behind who casually informed us he’d been on the 14 day moorings for a month. Actually a shorter time will suit us as the odds on us not standing in towpath dog faeces increases every day. There is a clock tower opposite out mooring which we thought would be very handy for checking the time. It was 3.40pm when we arrived. After completing our mooring routine and having a late afternoon cuppa we headed to the nearby Tesco at 3.40pm????? 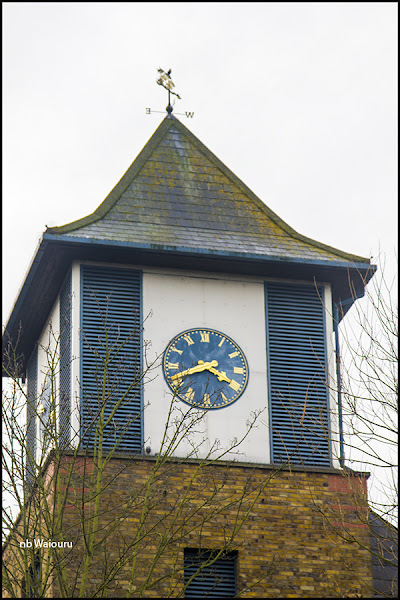 The route to Tesco required a circumnavigation of the clock tower. That’s when we discovered the time was actually 10.50am. But wait….. No, it was 11.20am. 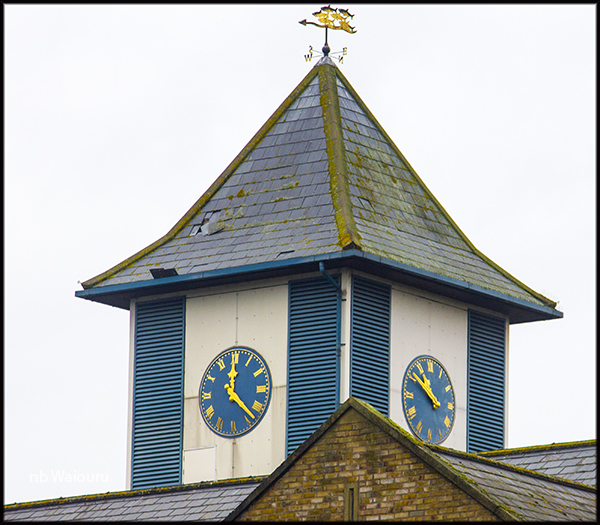 Time stands still in Rickmansworth. Hopefully than means we won’t age during our stay! There are the usual number of towpath walkers. Many with dogs. 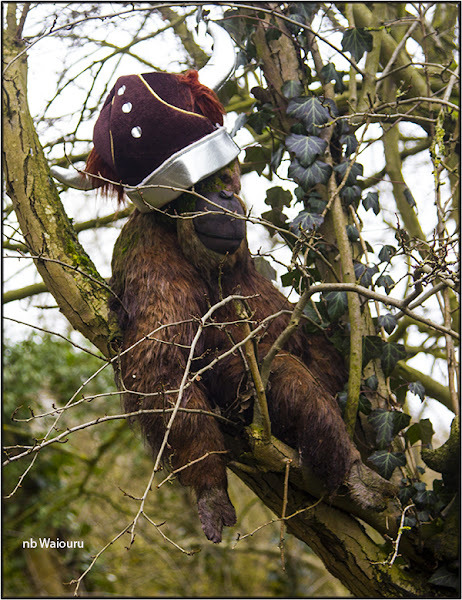 The great surprise were the Rickmansworth monkeys. 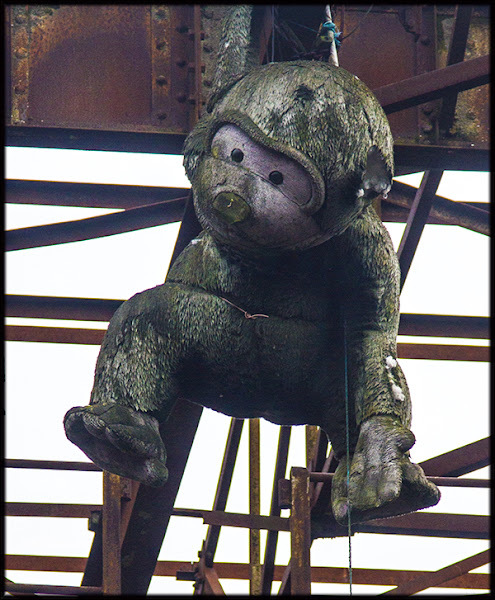 The first was observed swinging from a steel girder on derelict canal side building. Obviously there is plenty of food around because he was rather large. His partner was resting in the bough of a nearby tree. Appetite obviously sated and a slightly amused look on his face. It’s going to be fun finding any other interesting locals. Taking advantage of the good weather we started cruising south towards Rickmansworth. We’d scarcely left the mooring when two CRT employees appeared from behind us with one carrying a PDT (portable data terminal). 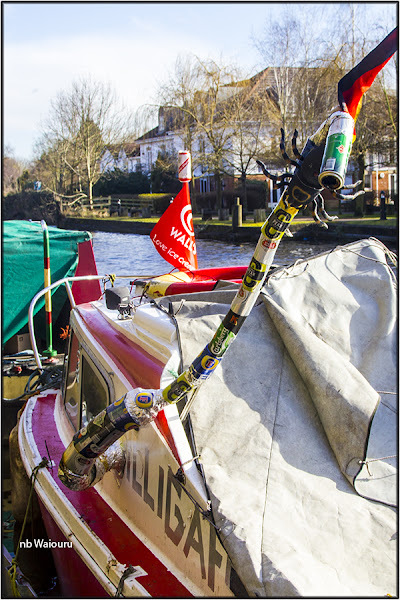 We assumed they were enforcement officers checking the moored boats, however they didn’t appear to be all that interested in collecting boat license data. We caught up with them at Cassiobury Top Lock and Jan asked what they were doing. It transpired they were conducting a check/audit of the canal infrastructure. 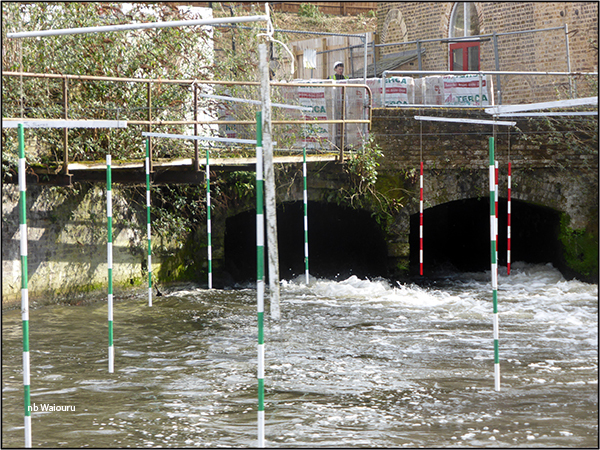 That is when we realised they had been examining sluices, towpath condition, locks, weirs, etc. Apparently they were going to be checking all the way to Rickhamstead. It’s good to know CRT checks the condition of the canal infrastructure and this should enable the prioritising of maintenance work and early intervention. But I did wonder why they were not also checking boats? By not doing this there will be additional costs in having another CRT employee walk the same length of canal. The current CRT culture appears to be too “compartmentalised!” My initial impression is there are cost savings to be achieved. We stopped to top up the water tank above Cassio Bridge Lock and then Jan gave two pre-schoolers and the grandparents a demonstration on lock work. Jan was rather amused with the actions of the young girl who was struggling to push open one of the gates when the lock was half full. 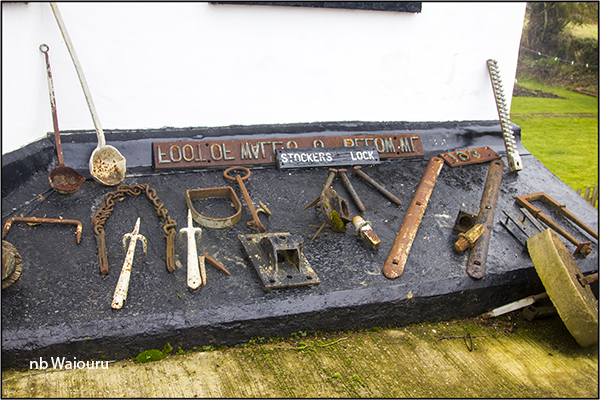 Her grandfather offered to open one of the lower lock gates only to discover they are very heavy! 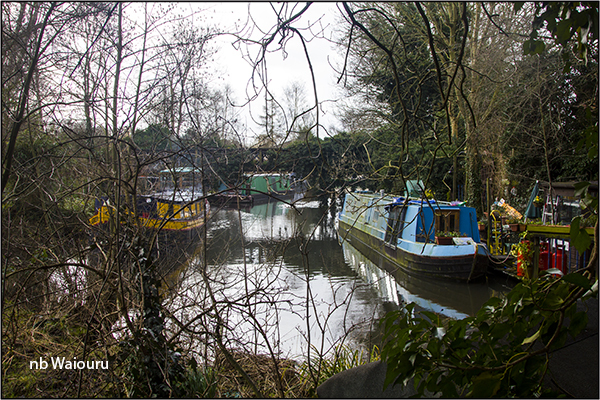 From this point onwards the canal appeared to be in a semi rural setting with a scattering of old boats moored on the offside. Most of them had a beaten path leading away from the mooring through the scrub. After checking the map I noted this area is designated ‘Common Moor’. My assumption is these boats are not on official end of garden moorings. We’ve also started to notice an increase in the number of boats either not displaying a licence or the displayed license is expired. It will be interesting to observe whether this situation becomes worse as we get closer to London. 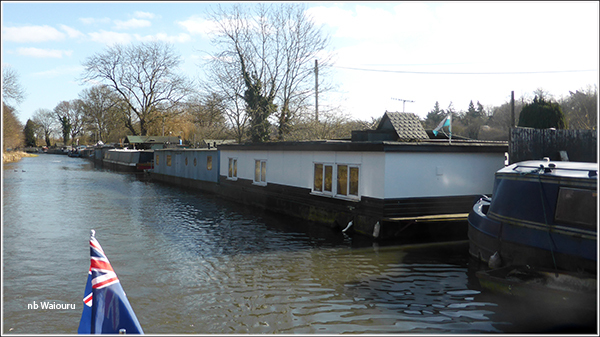 After Lot Mead Lock there was a row of houseboats moored on the offside. 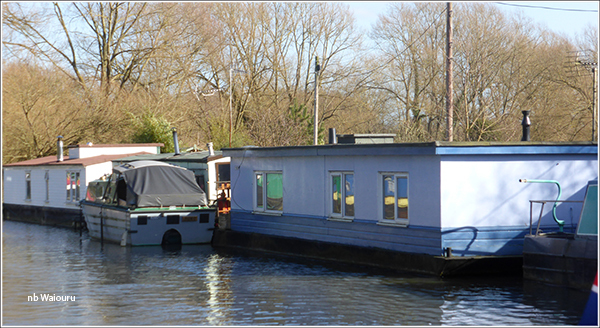 It’s been a long time since we saw houseboats. Actually it might be the first time. But no! 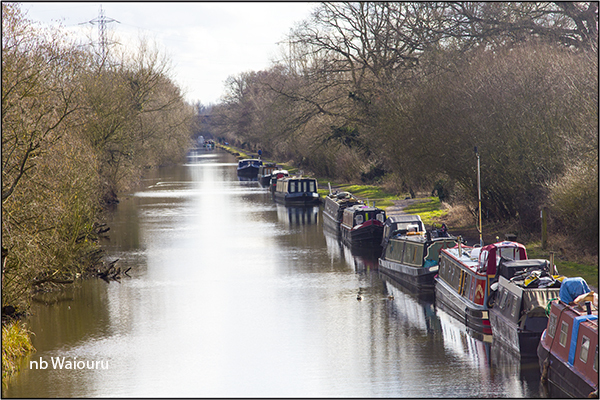 I recall there were a few at the bottom end of the Erewash Canal. The following boat was on the towpath side. 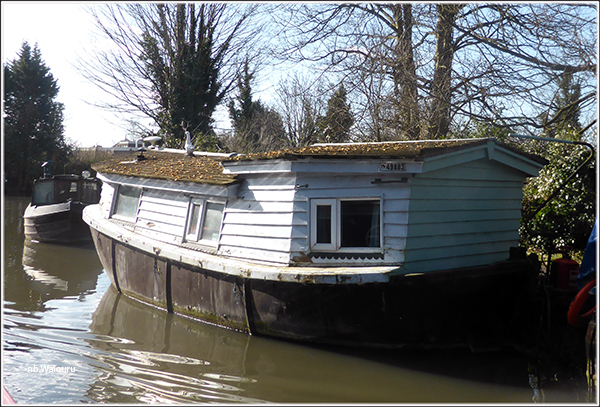 Would this be classified as a houseboat? Or is it a “cottage boat”?